Win The Gift: Joel Edgerton gets sinister | SWITCH. Can you really go through life having never wronged anyone? Even if you are unaware of how, or when, and even who you may have wronged. Chances are there is someone out there who won't ever forget it - or you. Simon (Jason Bateman) and Robyn (Rebecca Hall) are a young married couple whose life is going just as planned until a chance encounter with an acquaintance from Simon's high school sends their world into a harrowing tailspin. Simon doesn't recognize Gordo (Joel Edgerton) at first, but after a series of uninvited encounters and mysterious gifts prove troubling, a horrifying secret from the past is uncovered after more than 20 years. The 'The Gift' competition has now closed. Winners will be announced shortly. Competition opens at 5pm AEDT on Sunday 27th December 2015 and closes at 11:59pm AEDT on Sunday 3rd January 2016. Five winners will be chosen at random on Monday 4th January 2016. To successfully win, entrants must fulfil the above entry conditions before the time the competition closes. Current members/followers are eligible to enter the competition. Only one entry per person. Only one winner per household. To be a valid winner, the entrant must not have won a prize from SWITCH within the last 28 days. Each winner will receive one Ultraviolet Blu-ray copy of 'The Gift'. By entering, you agree to receive occasional emails from SWITCH in the future. If you decide to unsubscribe from these updates, any further entries will not be applicable. Only Australian residents are eligible to enter. 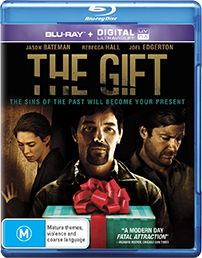 'The Gift' is available on Digital Download, DVD and Ultraviolet Blu-ray on Wednesday the 30th December 2015 from Roadshow.